So Lonely in Gorgeous: Goin' Coconuts...Tasty Related, Not Beauty Related! Goin' Coconuts...Tasty Related, Not Beauty Related! Seijo Ishii Supermarket is a grocery chain, throughout Japan, that offers a wide array of domestic and international foods and drinks. 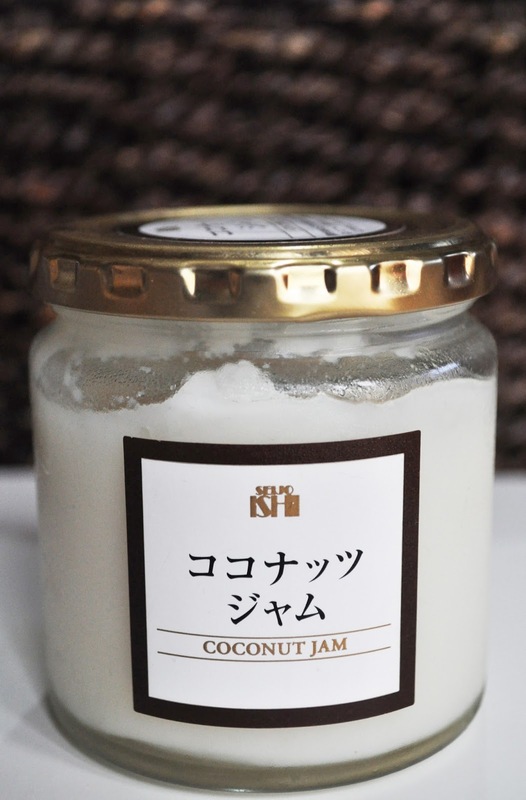 My recent love is Seijo Ishii's Coconut Jam. My goodness, this jam is so delicious that I fear for my waist line. I've had it every which way, including straight out of the jar. However, my favorite way to have the jam is over one or two spoons of cream cheese. If you can get coconut jam...try it...it's awesome! Have you tried Coconut Jam? I'm Indonesian, so I've had kaya before, which is a (usually pandan-scented) coconut-custard jam, thickened with eggs. It's super popular in SE Asia as a melty cheese sandwich filling, accompanied with coffee. The Seijo Ishii jam looks interesting, though. Is it just thickened sweetened coconut milk, or are there any other ingredients in there? Ditto this question. I love coconut & this looks amazing! I wonder if I can find it here in Canada. It more of a thickened sweet coconut puree with fine pieces of coconut. Delicious! And Toby, I thick you can find coconut jam in Canada.